Robert G. “Bob” Flory, age 83, passed away Wednesday, January 23, 2019. He was born June 30, 1935 in Waukegan to Carl and Esther (Zilinsky) Flory. Robert was a proud veteran of the U.S. Army, and was stationed at Fort Huachuca in Arizona. He was a longtime resident of Fox Lake and was a member of the Fox Lake V.F.W. Post 703. Bob was employed over 35 years as a conductor for the Milwaukee Railroad. He was an avid Packer fan, Cubs fan, NASCAR fan, and he loved Neil Diamond music. Bob will be remembered most for being a loving father, brother, uncle, friend and a doting grandfather to all of his grandchildren. He is survived by his five children, Kim (Christopher) Vicicondi, Ruth (JR) Michniewicz, Michele (Vernon) Shields, Robert C. Flory, James Flory; nine grandchildren, Dawn, Rachel (Chris), Brian, Edward (Caitlin), Joseph, Kevin, Ricky, Amber, Jessica; 14 great grandchildren, Kylie, Braelyn, James, Mila, Zachary, Kaleb, Alli Grace, Eddie, Lillian, Riley, Kayleigh, Sadie, Chloe; a brother, Harold (Susan) Friedlund; and many nieces and nephews. He was preceded in death by his parents; a daughter, Laura A. Flory; a grandson, Aaron Tobias; a great granddaughter, Khloe Hill; and a sister, Ruth Flory. Visitation will be on Monday, January 28, 2019 from 11 a.m. until the 1 p.m. funeral service at Thompson Spring Grove Funeral Home, 8103 Wilmot Road, Spring Grove, IL 60081. Interment will be in Grant Cemetery, Ingleside. 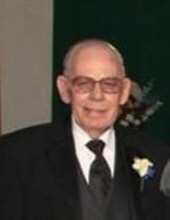 To send flowers or an online condolence to the family of Robert Flory, please visit our Tribute Store at www.ThompsonSpringGrove.com For information, please call the funeral home at 815-675-0550. To send flowers or a remembrance gift to the family of Robert G. "Bob" Flory, please visit our Tribute Store. "Email Address" would like to share the life celebration of Robert G. "Bob" Flory. Click on the "link" to go to share a favorite memory or leave a condolence message for the family.